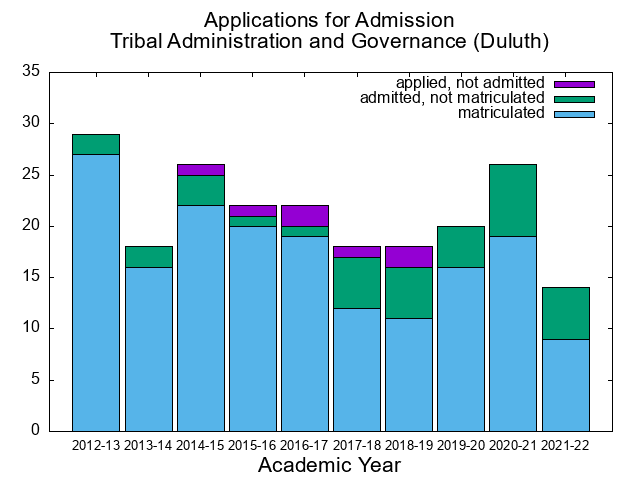 These tables show how many applications were received requesting admission for a given academic year, regardless of when the application was eceived. Applications are actually for an academic term; consecutive Summer, Fall, and Spring terms comprise an academic year (most applications are for Fall terms). Depending on the page you are viewing, you will see one or more of: data for an individual graduate program, followed by data for all programs in that program's college, followed by data for all programs in that program's CGS broad field, followed by data for all U of M graduate programs. Data is from the University of Minnesota's Peoplesoft student information system, via the data warehouse (dw.umn.edu). Most applications are processed by the Graduate Admissions office, but some programs will process their own applications, or use a national application service. Application data shown here for these other programs may be incomplete if, for example, only the admitted applications are entered into the Peoplesoft system rather than all applications. For each category (e.g. Masters), the percentage shown is the percentage of the total applications for the group. Gender is self-reported. Reporting gender is optional, so males+females may not equal the total. "International" means applicants who are not citizens or permanent residents of the United States. "Minority" includes citizens and permanent residents of African-American, Asian-American, Hispanic/Chicano/Latino, American Indian, and Hawaiian/Pacific Islander ethnicity. 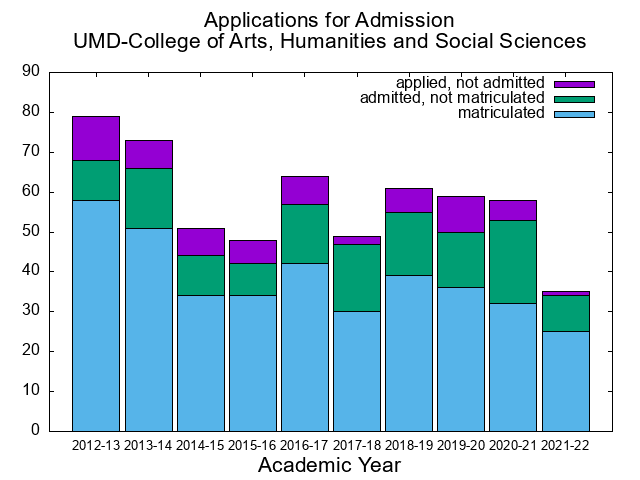 These tables show how many applications were offered admission for a given academic year. Admission is actually by academic term; consecutive Summer, Fall, and Spring terms comprise an academic year. For each category (e.g. 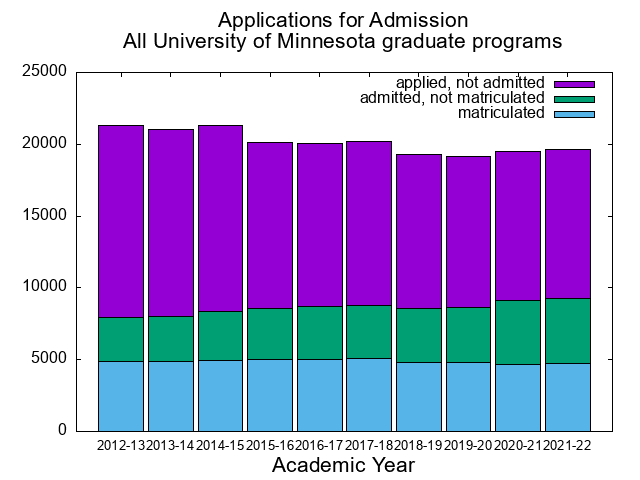 Masters), the percentage shown is the percentage of the applications for that category that were offered admission, or the "yield." These tables show how many offers of admission were made for a given academic year, and the makeup of the admit pool. For each category (e.g. Masters), the percentage shown is the percentage of the total admits for the entire group. These tables show how many students matriculated (enrolled for the term for which they were admitted) for a given academic year. For each category (e.g. Masters), the percentage shown is the percentage of the admits for the category that matriculated, or the "yield." "International" means students who are not citizens or permanent residents of the United States. These tables show how many students matriculated (enrolled for the term for which they were admitted) for a given academic year, and the makeup of the matriculation pool. For each category (e.g. Masters), the percentage shown is the percentage of the total matriculations for the entire group. These tables show how many admitted students ("N") took each GRE exam, and their average score ("Avg"), followed by the score distribution. Not all graduate programs require GRE exams for admittance. If an applicant took the same exam more than once, and reported all scores to the U of M, the highest score is used. "Verbal-old" and "Quant-old" are the old versions of the Verbal Reasoning and Quantitative Reasoning tests, with score range 200-800. "Verbal-rev" and "Quant-rev" are the revised (August 2011) versions of the Verbal Reasoning and Quantitative Reasoning tests, with score range 130-170. "Analy Writ" is the Analytical Writing test, with score range 0.0 to 6.0. These tables show, for matriculated students, the location of the institution from which they received their most recent previous degree (typically their bachelor's degree). For each region, the percentage shown is the percentage of the total matriculants whose institution of previous degree is located in this region. These data may not be available for programs whose applications are not processed by the Graduate Admissions office.